Taste test: These Pop-Tarts were brown with white frosting on one side, a squiggle of green frosting on top of the white frosting, and brown sprinkles (or, as we say in Boston, jimmies) on top of the frosting. 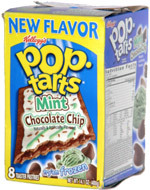 Inside each Pop-tart was a brown mint chocolate filling. I tried a toasted one and an untoasted one, and things worked out pretty good in both cases. There was with a good mix of mint and chocolate, and the whole thing was moist enough that don't need to have it with milk, though it was quite good when I did. The taste didn't really remind me of mint chocolate chip ice cream (my favorite flavor) but it was still a good taste. Smell test: Good mint chocolate smell.